07837 965767 or email dunnhome2@btopenworld.com. Pilots briefing 1030 AM with flying commencing soon after. Please can you bring your BMFA insurance with you. We may be able to run a low key competition on the day so keep practising!! Barbeque will be available from 1230, heat will be supplied in the form of disposable barbecues but bring your own food to cook and drinks for the day. Please could you email myself or indicate on this thread if you are attending. Chris and I look forward to see you on the day. As with many events advertised on here, where are you? 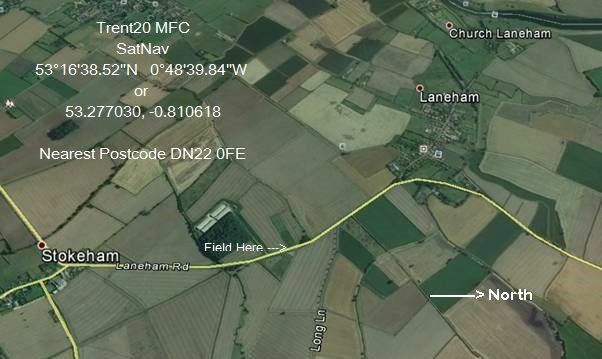 The site is positioned half way between Worksop and Lincoln. Enter the above map reference in Google and the map will come up, showing exactly where it is. OP has all you need. Weather is looking better for Sunday so should be a good day. 90% sure I will be there ! Team Bullett ! Come on team Bullet !!!! Only 90%!! Come on Tony. 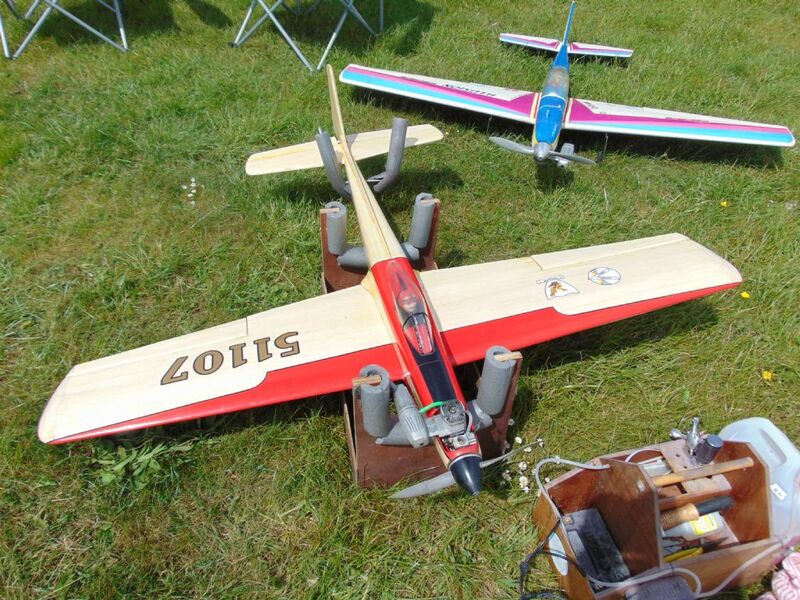 Just to make people aware, I will be taking some items for sale, retro aerobatic orientated, due to a change in circumstances. I would rather these be used than just hanging around in the workshop. Redshift 61 New bearings fitted, excellent compression. OS 61 RF Everything is as per Hanno Special apart from the piston and liner that is RF. The piston and liner are virtually brand new, having only been run 5 times in my Supra Fly 60. OS 61 RF Good bearings and great compression. Webra Speed 40 ABC Excellent engine, complete with muffler and manifold. Veco 19 Excellent engine, great for Flea Fli etc. Hope nobody objects to me putting these on here but if I didn't, the answer on the day would be, 'I wish I had known, I would have brought some money!!! Redshift 61 has been sold. Adam Collins is attending as well. Well, what a brilliant day. After a Saturday that saw heavy rain, thunder and lightning and hail in some parts, Sunday was the complete opposite. A brisk breeze, sunshine for most of the day (Sue says I look like a matchstick!) and the field to ourselves, what more could one ask for. Well, one thing is modellers, of a like mind, who've not forgotten the thrill of producing a model themselves and then experiencing it perform to expectations, offering complete satisfaction in terms of modelling. Six pilots decided to have a go at the one round competition with myself as judge. 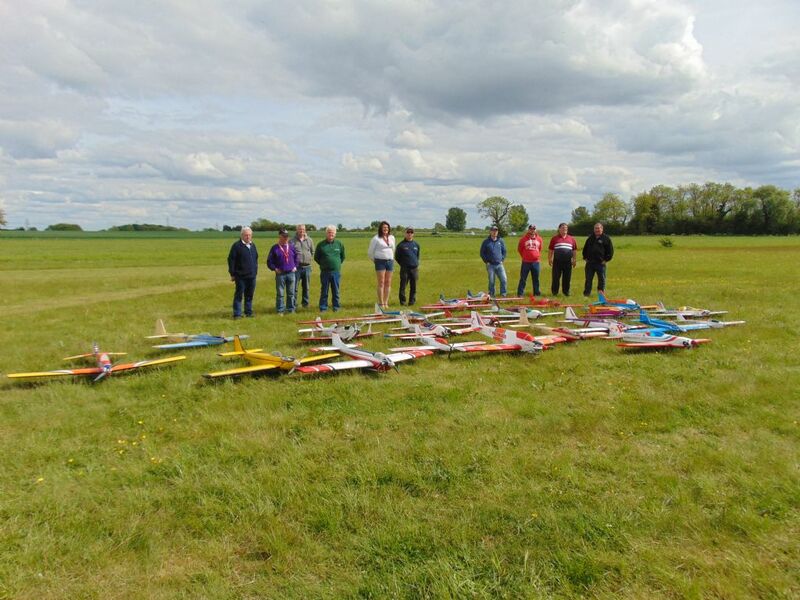 It's quite often the case that the flight starts well then one mistake takes your eye off the ball and concentration goes, hence the remainder of the flight is not as good. 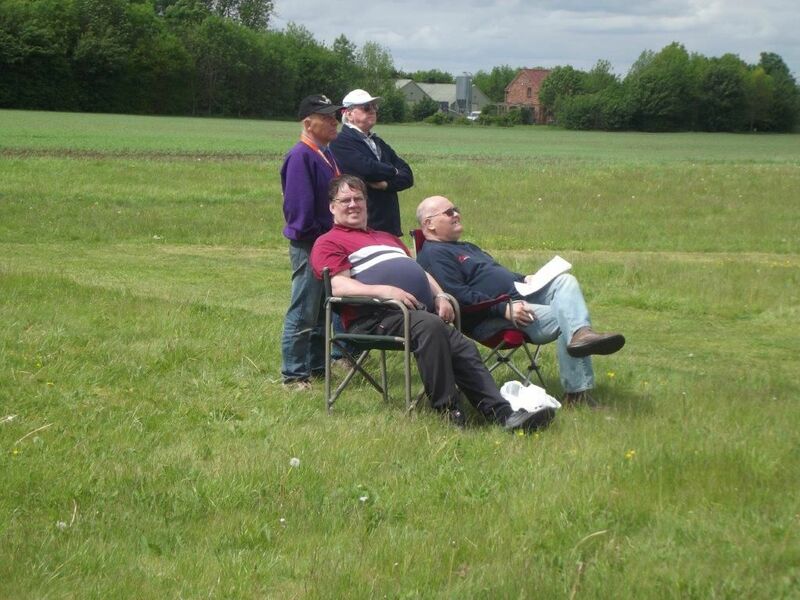 Pilots who, will fly confidently in front of others at these events then find that the jitters set in when they know that they are being closely looked at by a judge, and others. Doesn't fare well for the thumbs on the sticks. The outcome was 1st, Minty Morton, 2nd Paul Lacey and 3rd Shelley Redworth. 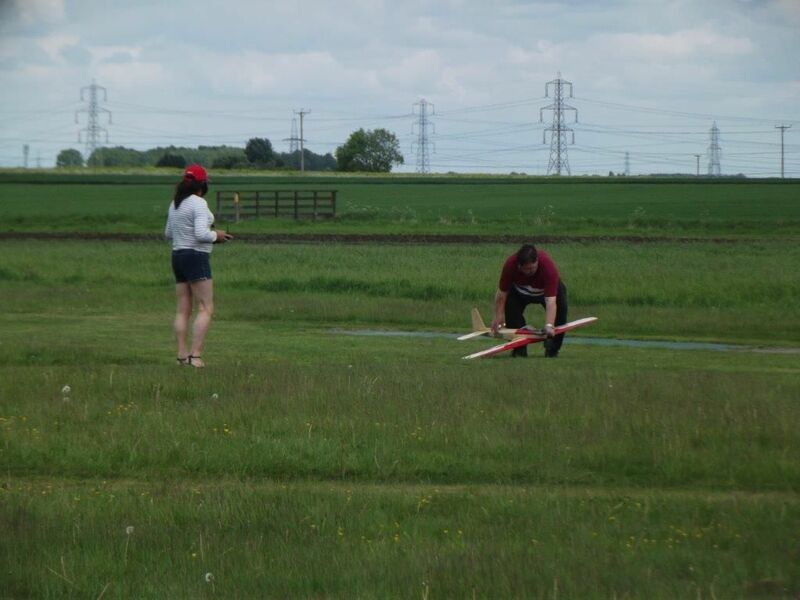 The main difference was consistency throughout the flight, perhaps not scoring the highest on any individual manoeuvre but was consistent in achieving good scores all the way through. Kelvyn Petrie's Atlas. I have to tell you what it is because he forgot to put the stickers on it that I had done for him! 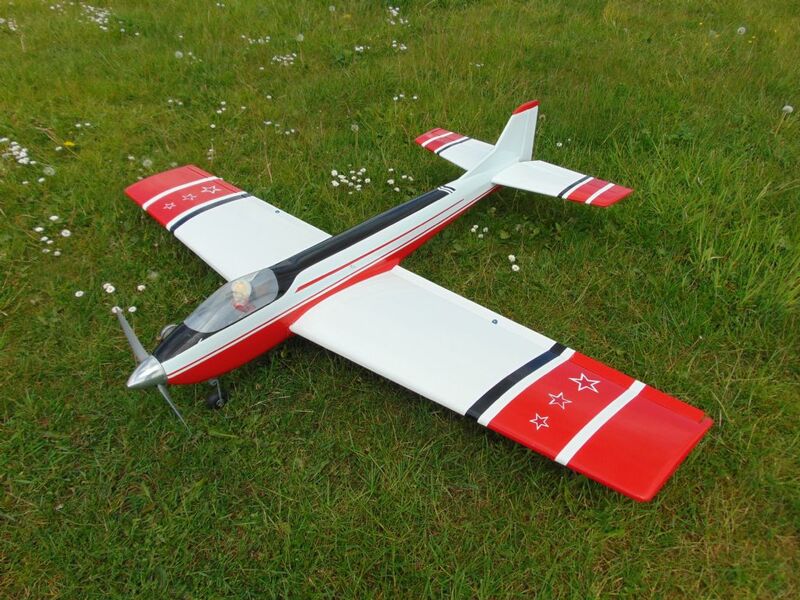 Webra 61 LS for power. Kelvyn with his Upset II. Irvine 53 for urge. Many of these models are now amply powered by modern day engines of lower capacity than those available 'in the day'. Shelley's Illusion. Seen better days as Shelley will admit to herself. 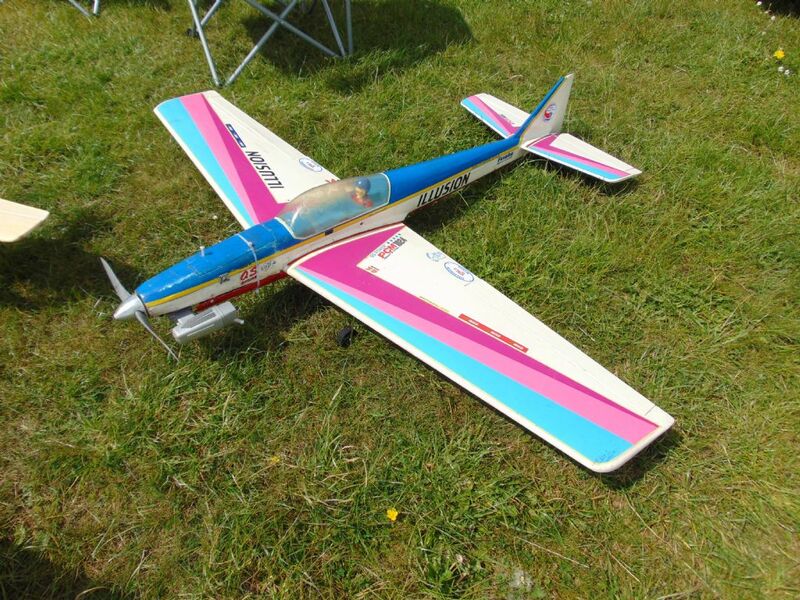 OS 91 FX has more than enough for what is a heavy airframe. Shelly stuck to flying her Moonglow all day. 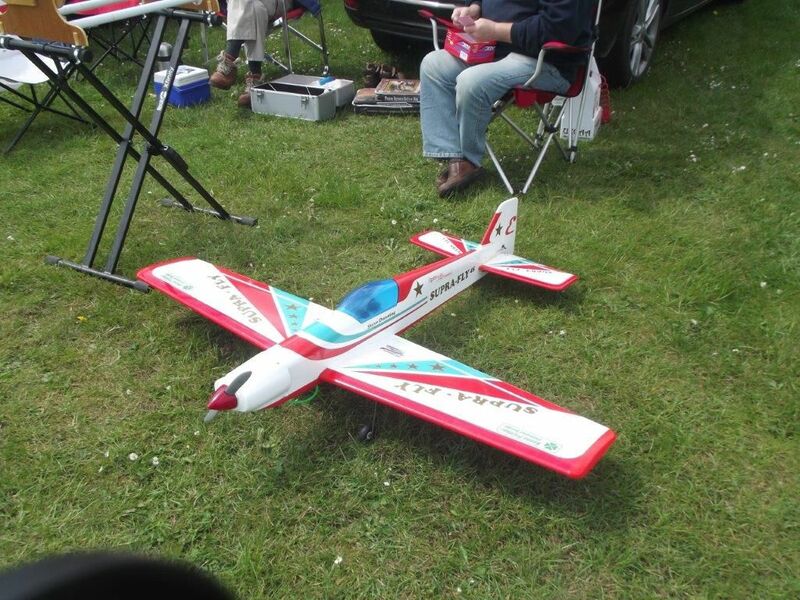 Part of 'Team Bullet', Tony Bloomfield flew this excellent example. 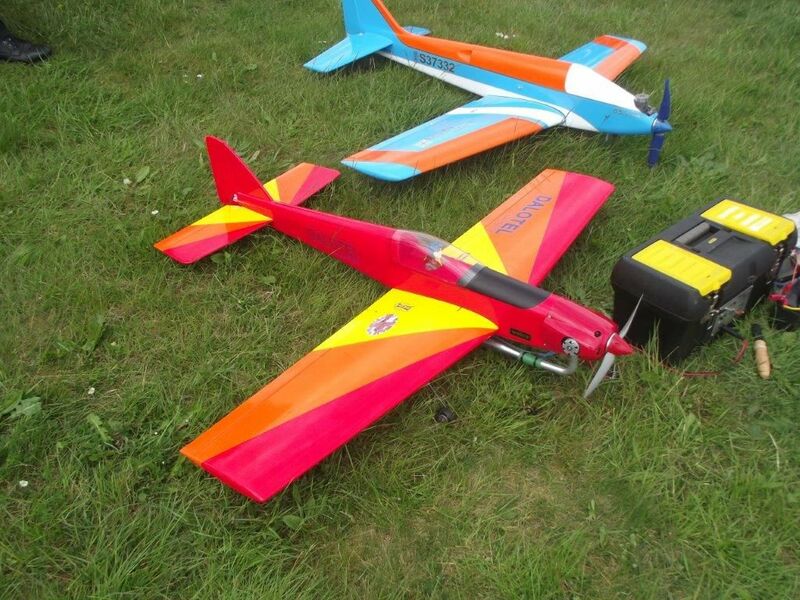 Stephen Lindley came over from Sheffield and brought three models, a Bullet (background) and these nearly identically finished Supra Fly and a Priory Models Silhouette. 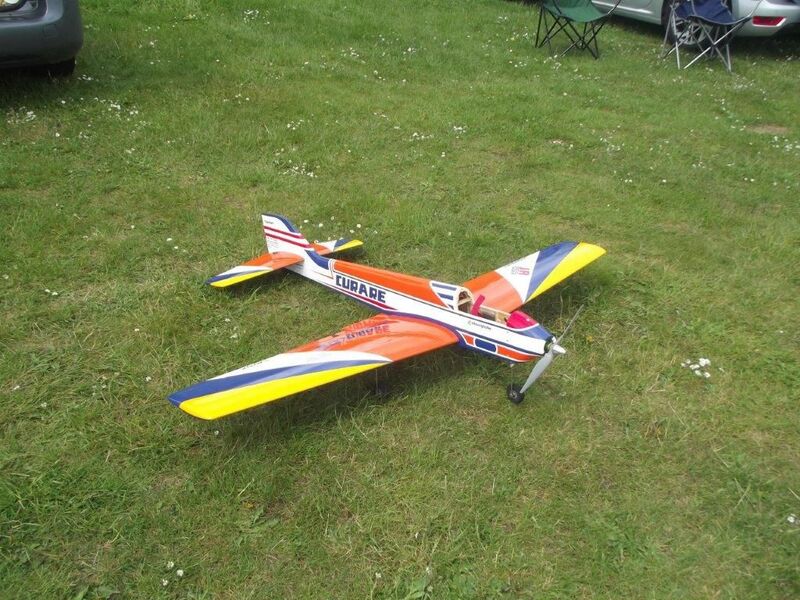 Adam Collins flew a Super Lightning and had an extended competition flight due to a throttle servo problem. 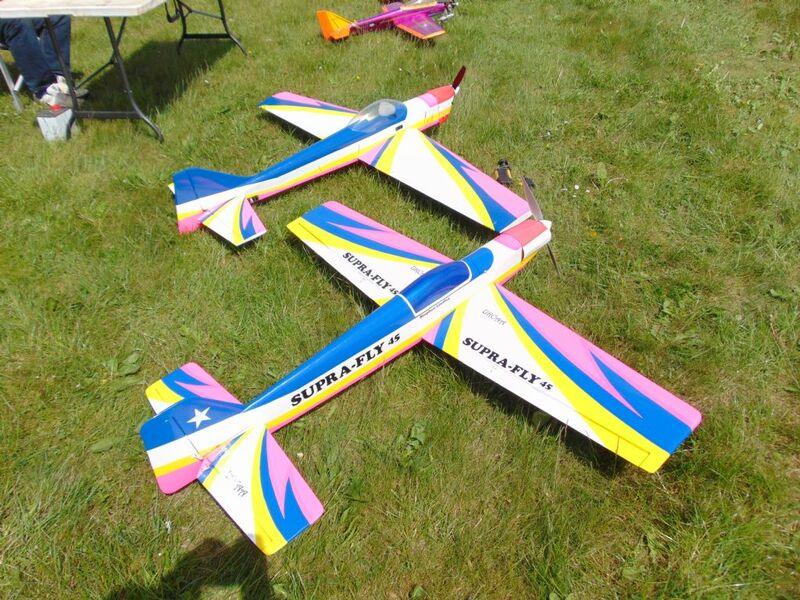 My own Supra Fly, powered by an OS 45 FSR. Matches the airframe very well. 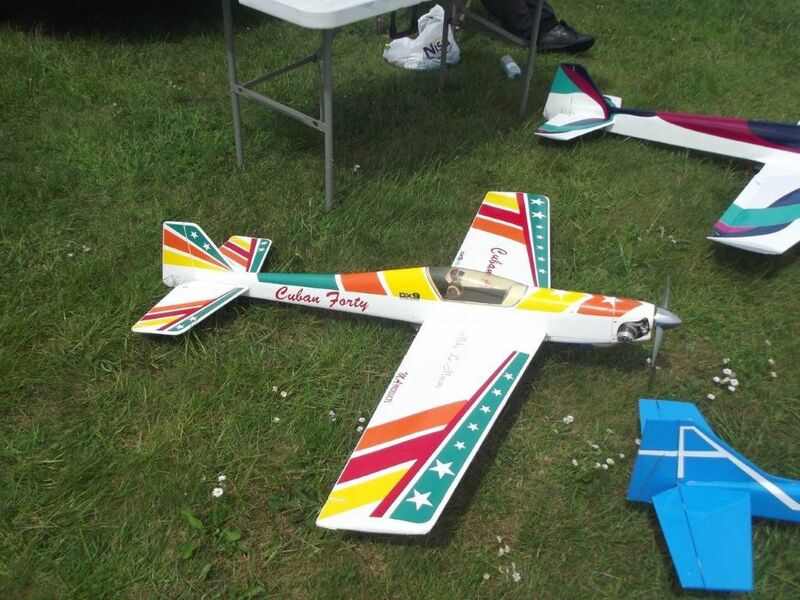 Dave Ashcroft's Curare ARTF, sans canopy. 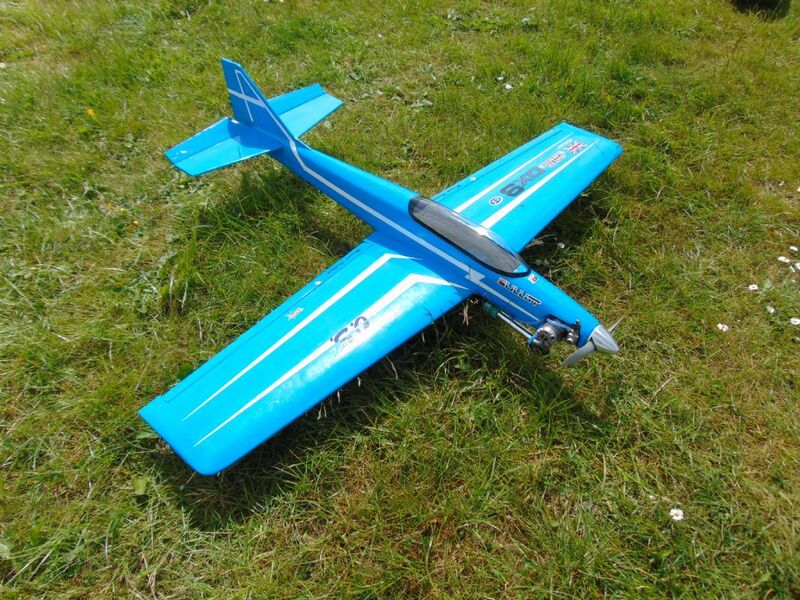 6S Lipo's power this model. Still in the trimming stage at the moment, this was the only ARTF on the day, quality is excellent. Shelley and Tony enjoying the sunshine. The cut off date was brought forward at last years AGM to December 1995, enabling Tony B to bring along his Cuban Eight 40. 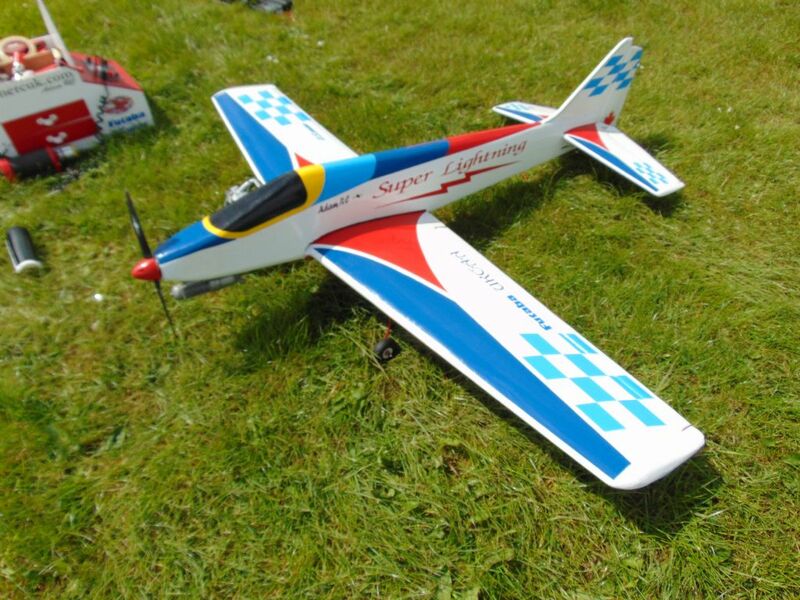 Paul Lacey's Dalotel Super Sport, built from a Dave Smith kit but with a pair of wings from yours truly. 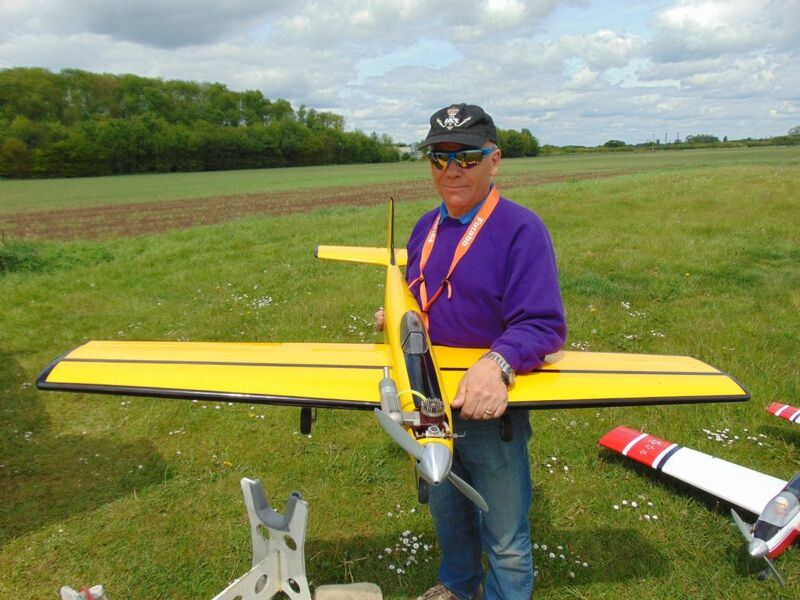 Tony putting the Moonglow down, prior to another flight from Shelley. Me judging, Tony checking to see how I scored and Kelvyn (and buddy) following closely. That looks to have been a grand day out, I wish I could have joined you. Those ARTF Curares do fly well, I've had mine on both IC and electric and still can't decide whether it's really slower on leccy or whether it's an illusion caused by the lack of noise. OOOOOOPS! Error. In the above please read Paul Saxby and not Paul Lacey. Sorry Paul. Yes great day even prompted me to practice ready for the next meeting at Retford and try the low profile comp !